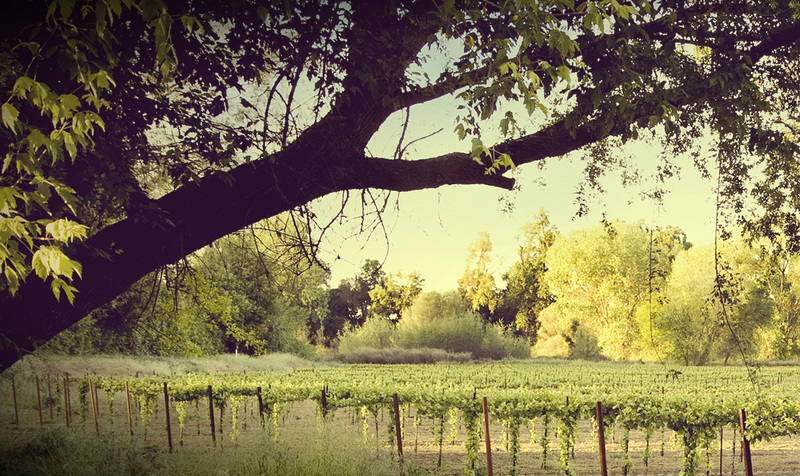 LODI RULES for Sustainable Winegrowing is California’s original sustainable viticulture program. This program truly began from the ground up, with grape growers deciding it was important for the future of the Lodi region. Our certification process is rigorous, based in science, voluntary, and third-party accredited and audited. LODI RULES certified growers make up an innovative community with a history and commitment to farming quality winegrapes through the implementation of viticulture practices that balance environmental, social, and economic goals. 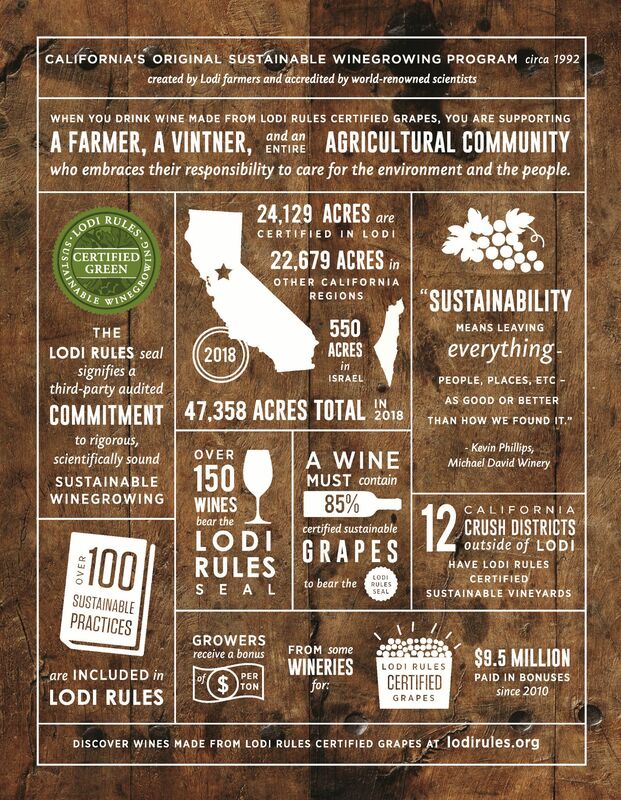 LODI RULES is designed to communicate their commitment to sustainable agriculture to wineries and the general public. LODI RULES has two key components. First, LODI RULES promotes winegrape grower adoption of over 100 sustainability practices, which are called “Standards”. The Standards were collaboratively developed by a team of Lodi winegrape growers, viticulture professionals, and scientists, and were first accredited by Protected Harvest in 2005. The LODI RULES Standards are the backbone of the program, and are organized into six Chapters: 1) Business Management, 2) Human Resources Management, 3) Ecosystem Management, 4) Soil Management, 5) Water Management, and 6) Pest Management. Each Standard meets three criteria: first, it is measurable; second, it addresses at least one of the three aspects of sustainability (environmental health, social equity, and economic viability); and third, it is economically feasible to implement. The LODI RULES Standards are the most thoroughly and rigorously vetted set of sustainability practices in California’s viticulture industry. All Standards have been peer reviewed by world renowned scientists, members of the academic community, and environmental organizations. The second key component of LODI RULES is the pesticide risk model, PEAS, which is unique to LODI RULES. Pesticide Environmental Assessment System (PEAS) is a risk model used to quantify the environmental and human impact of all pesticides applied in a vineyard. The PEAS model generates an Environmental Impact Unit (EIU) for each pesticide, which is based on the pesticide’s impact on 1) acute risk to farm workers, 2) dietary risks from acute and chronic exposure to people who consume the product, 3) acute risks to small aquatic invertebrates, 4) acute risk to birds, and 5) acute risk to bees and pests’ natural enemies. Pesticide use by LODI RULES certified growers must fall below 50 PEAS impact units for the growing season. A vineyard qualifies for certification if it meets several criteria. First, growers accumulate points through implementing sustainability practices and must sum to at least 50% of the total points available in each Chapter. Growers must accumulate at least 70% of the total points available across all six Chapters. Implementation of some Standards is mandatory. Such Standards are those that the program designers believe are imperative for sustainability. Certification is awarded to an individual vineyard on an annual basis. Certified vineyards must pass an annual independent audit to verify the implementation of sustainability practices. 2013 marked a year of improvements to the LODI RULES, the most significant of which was a content revision of the Standards. The LODI RULES Committee began the revision process in 2011 with the explicit goal of increasing the scientific rigor of the Standards while also making the program more adaptable to a diversity of vineyard conditions and management goals. In 2017, the Standards were further edited for clarity and consistency, and two new Standards were added to give growers credit for sharing sustainable viticulture knowledge and for conducting on-site collaborative research. The current, accredited, third edition Standards are available for download HERE. The LODI RULES program has grown vigorously since its establishment in 2005. As of 2018, over 47,000 winegrape acres are “Certified Green” in California. Within the Lodi AVA, over 24,000 acres are certified sustainable and 22,000 acres are certified in other regions throughout California – representing 13 different California Crush Districts. We’re happy to announce that the first international acreage became certified in Israel in 2017 when Golan Heights and Galil Mountain Wineries joined the program – read more about this historical certification HERE. LODI RULES is a partnership between the Lodi Winegrape Commission and Protected Harvest. The Commission created the program and provides outreach and support services to LODI RULES growers, actively promoting the program to the winegrape industry and the general public. The Commission’s LODI RULES Committee, which is made up of local growers and viticulture professionals, steers the program’s evolution along with Director Dr. Stephanie Bolton. Protected Harvest, an independent organization specializing in quantifiable sustainability certification, accredits the LODI RULES Standards and administers the certification process. 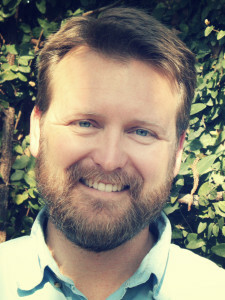 Protected Harvest is a nonprofit organization with a Board of leading environmental NGOs, scientists, and practitioners. For more information or to apply as a new grower and join a truly REMARKABLE, PROGRESSIVE community of committed growers, viticultural advisors, and winemakers, click HERE.